The global manufacturing company Tenaris has invested $1.3 billion to build a steel pipe plant in Matagorda County. Upon completion in 2016, the plant will employ 600 people with an annual salary of approximately $66,000. 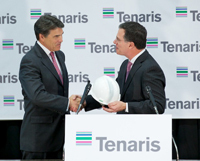 The Texas Enterprise Fund (TEF) contributed $6 million to close the deal with Tenaris. This is great news for the people of Matagorda County, and for Texas as a whole. We continue to be the best state in the nation for business, attracting great companies that create high paying jobs. It’s opportunities like this that allow for hardworking Texans to achieve the American Dream. The energy industry has time and again proved itself as a powerful economic growth engine. In Texas, we see the positive effect that fewer regulations and lower taxes have on creating jobs. That is something that Washington could learn from us. According to reports, the size of the Tenaris investment is between $1.3 and $1.5 billion. The plant will have an annual production capacity of 600,000 tons of seamless pipe used in drilling, producing or transporting gas and oil.